Last week, my friend Kirsten and I continued our tradition of discovering interesting locations around New Jersey and we tracked down this abandoned train car along the Delaware Canal Path. Apparently it's one of many train cars sitting on the tracks that run parallel to the river. From the looks of it, it's a popular spot for graffiti and shenanigans. Usually, Kirsten and I fail to find the place we're looking for (there really aren't addresses for abandoned places) so we were super excited that we managed to find this one. Lately I've been addicted to How I Met Your Mother. I only started watching the series a few weeks ago and I'm hooked. Within a month I managed to get to the middle of Season 5! Probably not something to be proud of. I figured I would get around to watching the series before my life got incredibly busy again. oh that's such an interesting place to discover! I absolutely love the location of your shoot and your shoes are amazing! 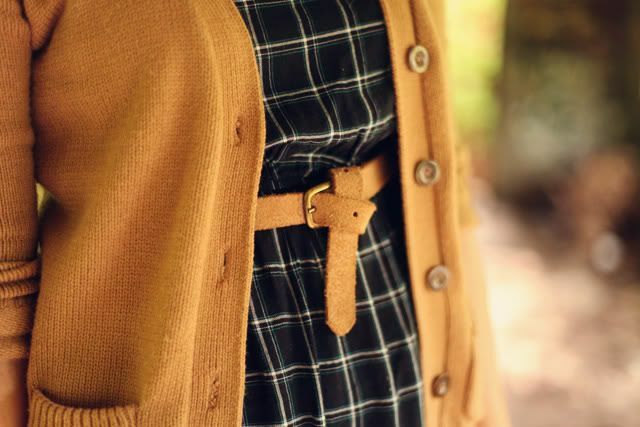 love how your sweater matches the colors of the train! very nice! indeed! beautiful location for photoshoot. looking simply gorgeousss i love the plaids! You're totally a shenanigan, which is totally why you found this spot. ;) Haha! But seriously, this is such a cool location. I love the way the light filters through and gives it this amber color. It's so ancient and neat-like. Your dress is so cute and that photo of your wedges is awesome. You take the coolest shoe photos. What an interesting and artistic combination! You look so very clean, neat, pretty and stylish modeling the Heritage 1981 Dress with a Zara Cardigan in that eerily abandoned railway car as a setting. I've never seen the show "How I Met Your Mother. Maybe I should try watching an episode. 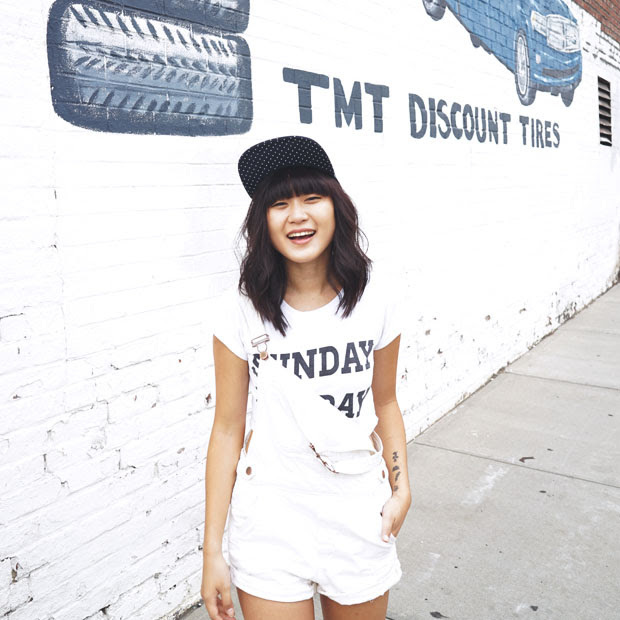 Join my first giveaway and stand a chance to win $50 Modcloth voucher! aaa, u looks so pretty <3 love all the photos ! I actually heard of many abandoned spots in NJ but never had the chance to go check them out. 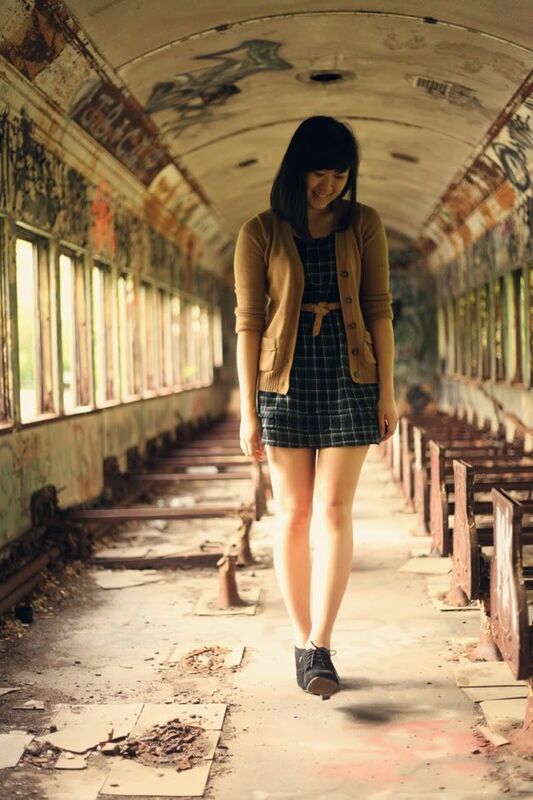 I hope to find this abandoned train you speak of, since I've always wanted to take outfit shots in abandoned areas. such an amazing photo spot! they are hard to find in any city, but when you find something like this, it's worth it! I love the way the light filters through and gives it this amber color. It's so ancient and neat-like. Wow!Ur black dress is looking so cute on your body.it gives extra ordinary effect on ur body.Nice all pictures.